While the heat descends on the town and country, a walk through the bush may be a pleasant activity. On our backdoor is the world renown arboretum - established by John William Hall, a chemist on the Thames Goldfield from late 1867. Drive up Mount Sea Road to the top car park and you will see the two entrances to the arboretum. There is a seat to stop and rest on (before or after), which has some glimpses of the sea through the trees below. ABOVE: The rest area at the carpark at the top of Mount Sea Road. The track top right leads up the hill to the top of the arboretum and a lookout area. There is a track beyond, that is not complete and not recommended at this stage. You walk back down the track to the carpark area. BELOW: Left: The seat has a memorial plaque - "In Loving Memory of RON HALL 1938 - 2017 Forever in our hearts" Right: View down to the lower track that does a circuit from Currie Street to Brunton Crescent Entrance and back up to Martin Street. There is a link to Korokoro Crescent entrance. Enjoy the bush walks around Thames! 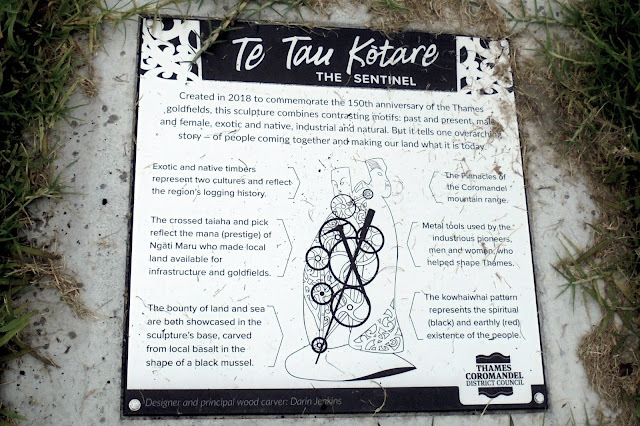 The Thames-Coromandel District Council has details of the John William Hall Arboretum, including a downloadable pdf document. 1. Many people were devastated when the 'Old Friends' site was removed from the Trademe Group. A substitute for this is the Facebook site "Old Friends Aotearoa New Zealand Schools'. You can ask questions, connect with other old school mates, browse and load photographs. Great for your own and genealogical research. Personally, I find it impossible to search for Thames School photos, but I am pointing out the site incase you can master searching through nearly 2000 albums. 2. There is a National Library project to save the information that was on the 'Old Friends' site. To find Thames schools, click on Waikato on right hand side of map of North Island. The next step is temperamental for now. CLICK on the yellow School label, Then click on T and scroll through till you get to Thames schools. NB> For the following stage you will find it easier to always select open in a new window, otherwise you can end up going back to square one each time!!! Parawai Playcentre - members and photos. Thames South School - members, and photos. Thames Parawai School - members, and photos. Thames North School - members and photos. Thames Kindergarten - members and photos. 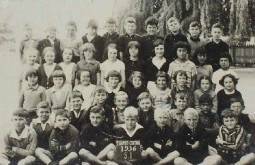 Thames Convent School - members and photos. Thames Central School - members and photos. Thames High School - members and photos. EXAMPLES BELOW: (not sure if the links will all work?? It doesn't seem that at present you can enlarge the photos??? 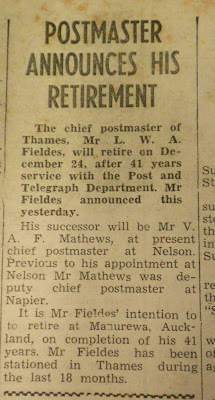 This one for Thames South 1934 is a larger photo. 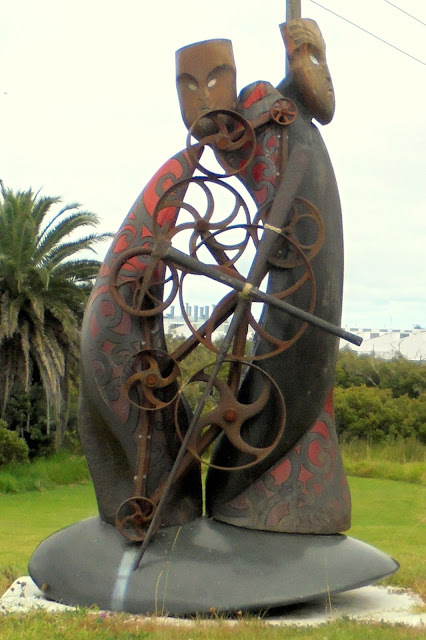 The sculpture is called Te Tau Kōtare - The Sentinel. 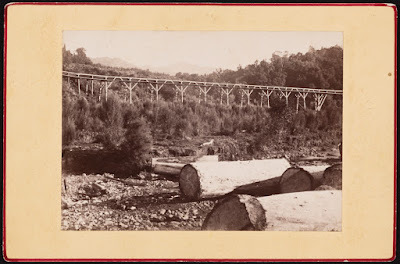 Located south-west of the Kauaeranga Bridge. "Exotic and native timbers represent two cultures and reflect the region's logging history. The crossed taiaha and pick reflect the mana (prestige) of Ngāti Maru who made local land available for infrastructure and goldfields. The bounty of land and sea are both showcased in the sculpture's base, carved from local basalt in the shape of a black mussel. The Pinnacles of the Coromandel mountain range. Metal tools used by the industrious pioneers, men and women who helped shape Thames. The kowhaiwhai pattern represents the spiritual (black) and earthly (red) existence of the people." 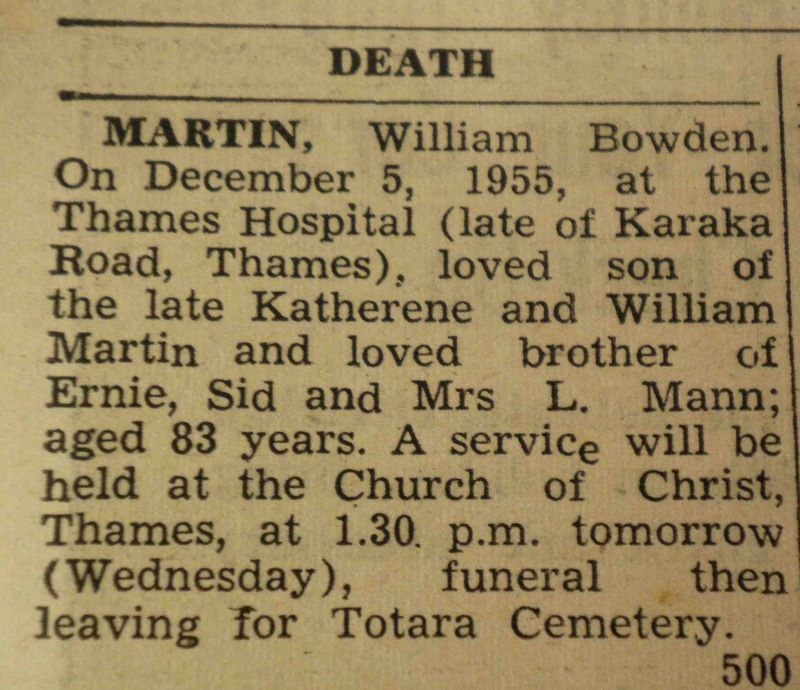 Thames (NZ): Photographic project at Totara Cemetery - the missing headstones? There are a group of researchers / genealogy helpers who take photographs of headstones at our local cemeteries. 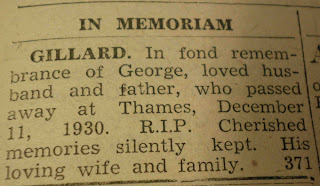 These are then posted on sites such as Find A Grave that I have previously mentioned and linked. 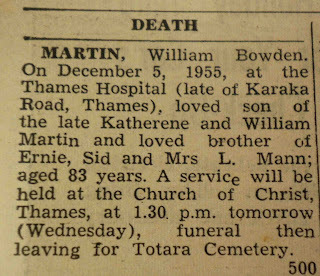 See Thames Cemetery Information Page. Often descendants / relatives are disappointed when there is no grave marker, and wonder what went wrong? Was the family short of money? Were they waiting until both partners passed? Has the stone been stolen or broken and not replaced? This week I found one block that appears unique. 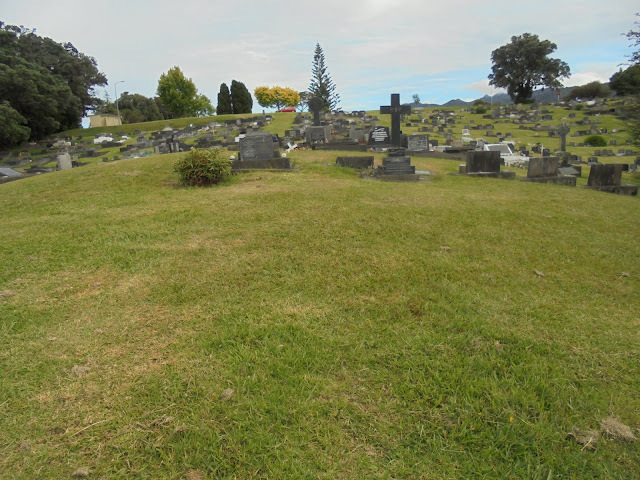 At the most southern boundary of the Totara Memorial Park Cemetery, Thames - is a block that has not one marker. The block is 75, full Id from the TCDC Cemetery site is: 2PUBL-075-0001 to 2PUBL-075-0022. 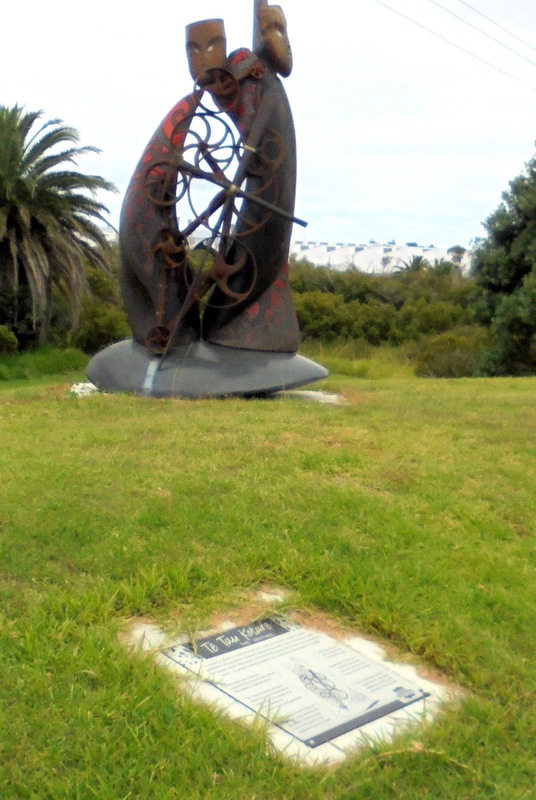 Council have no records of an event happening that could have damaged the markers, so the mystery remains. Further below are the names and details of those interred in Block 75. The location of Block 75, circled below. 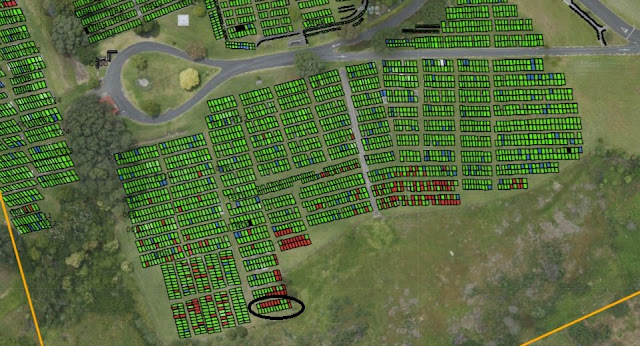 It is interesting that from aerial views of the cemetery it is possible to make out the change of terrain and some of the plot locations. 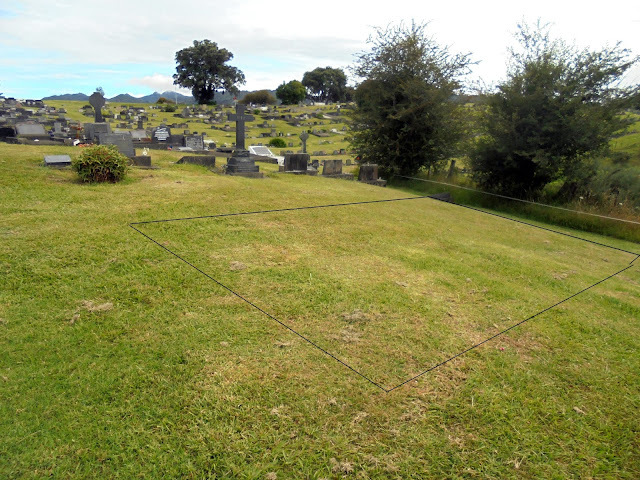 Above: Aerial View of Block 75, and the southern boundary of the Totara Cemetery - there are no headstones or signs of old markers on the ground. Below: View of the area from the ground. Lines drawn to indicate area of plots in Block 75. Above: View looking north from Block 75, towards the parking area at the top. 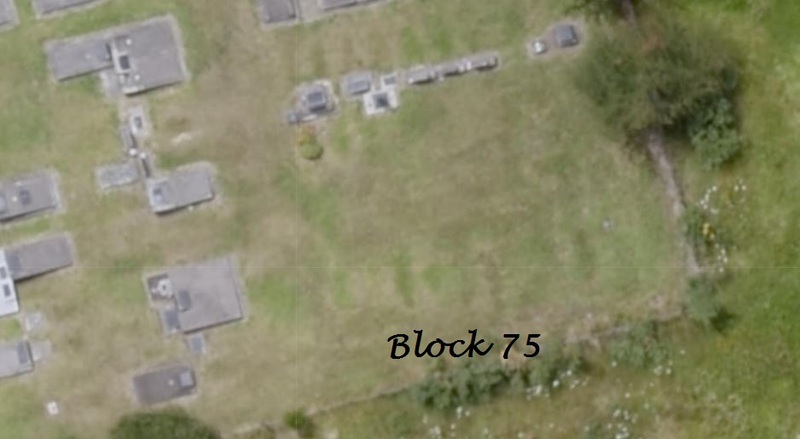 Left: Block 74, Block 75 centre right, with no headstone markers. Right: Looking eastward along Block 75. Maybe you have one of these people in your extended family tree or perhaps recall a time when a headstone was on the site. If you have any further information please let me know. 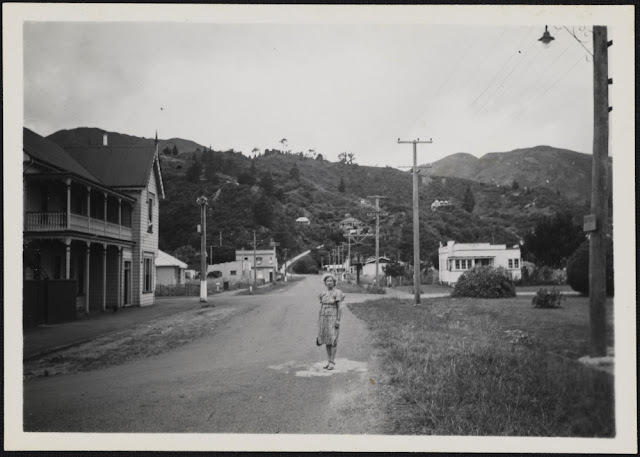 Thames (NZ): Photographs from Sir George Grey Collection - Have you seen these? 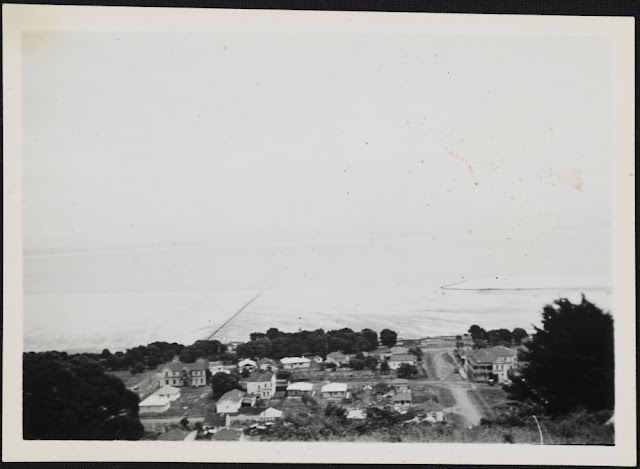 We are always on the hunt for new photographs, so it always pays to browse whats available at Auckland Libraries in their Sir George Grey Collection. Here are a few photos that I had either not seen before or at least forgotten! 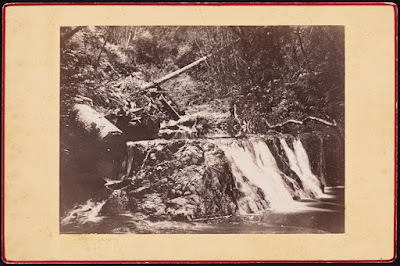 Showing an overshot waterwheel and associated buildings, probably part of a gold mining operation in the Thames area, possibly Brown and Campbell's Battery in the lower Tararu Valley. NB There are many more in this series relating to the Kauaeranga River and Valley. A blurred photograph, but a great view just north of Walter Street intersect with cars lined up getting petrol from Donkin's garage. This is a beauty looking across at the school of Mines, east along Cochrane Street. Well's had a butcher shop for many decades in the two storied building centre right, a few doors past that is the old Cornwall Arms Hotel. The houses top centre are in Princes Street, an extension off Upper Albert Street, with Broad Street below. Looking east along Richmond Street, Thames near Brian Boru hotel. Old Oddfellows' hall (right), later used as picture theatre, ballroom, skating rink and auction mart. 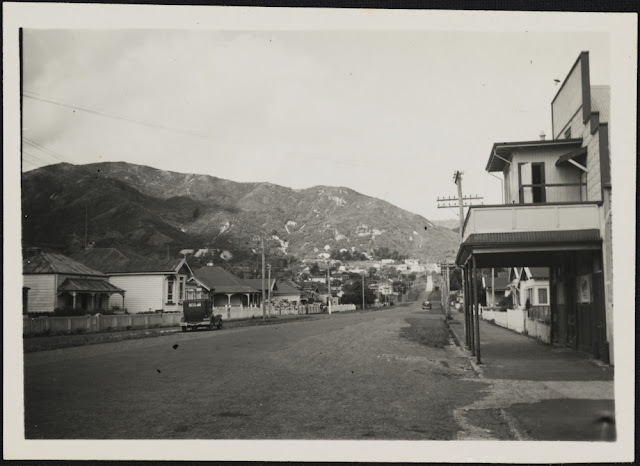 Great view looking up Richmond Street, to the Karaka (Una) Hill. For some reason these main side roads were so rarely photographed. As you can tell, there weren't many cars in Thames, and this was the case for decades. Old Thamesites could virtually recite who were the 'wealthy' families who had cars! 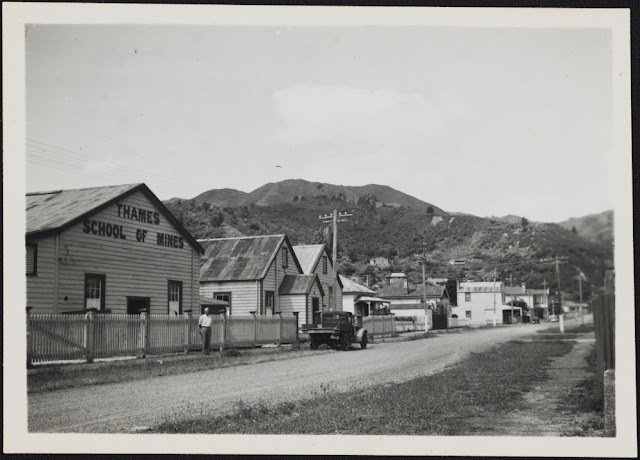 Many will remember the old auction mart that is in the vicinity of where Te Korowai is today. A great place to go and swap comics and an amazing place to skate! Another great view along Albert Street to Upper Albert Street in the distance. What year do you think this could be? 1940s or 50s? 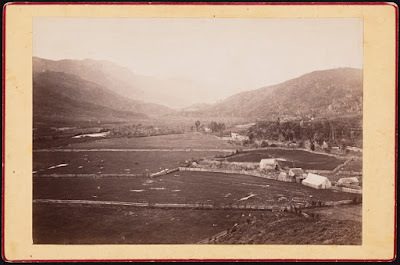 Look closer and you can get a good feel for the town and the hardship that was and had been endured. 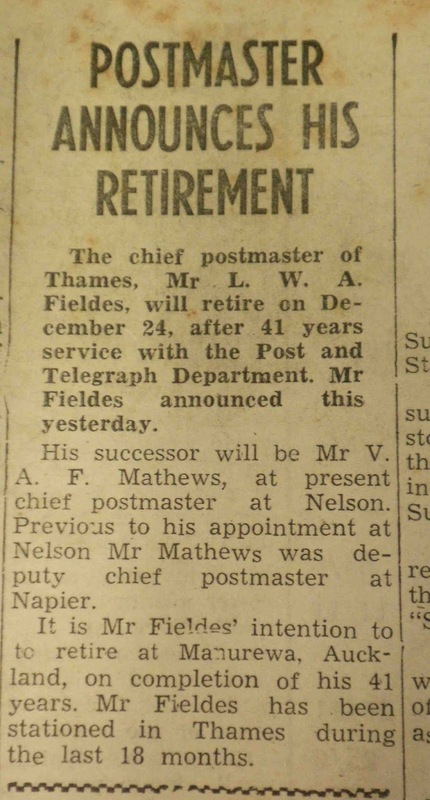 Thames was bankrupt in the 1920s and then hit hard by the 1930s Depression. The state of the streets and general maintenance is a window into these hardships. Victoria Park south is on the right. 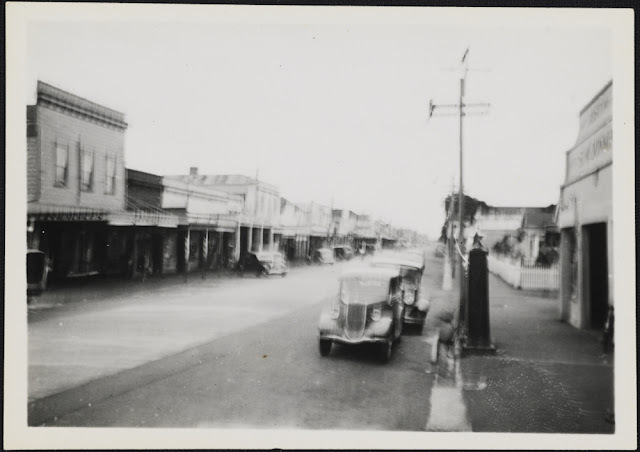 On the left is the Park Hotel, unless it is the 1950s, then the name had changed to the Lady Bowen Hotel. 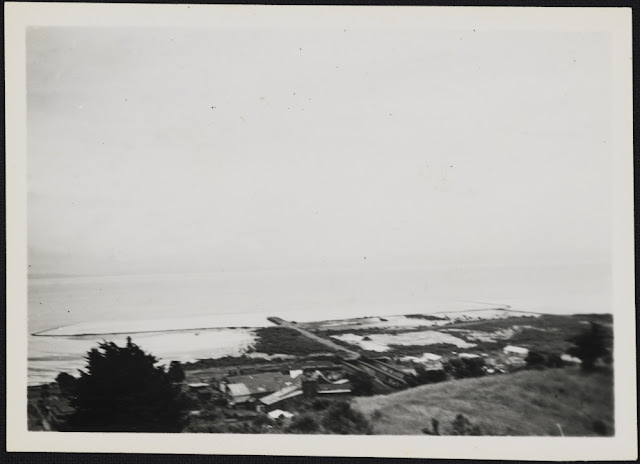 There is a selection of photographs taken from the Waiotahi Hill also of interest - some are blurred in the series but this is a great one below. Showing a view of the Firth of Thames from Monument Hill. Albert Street (left) and sewer pipe, Lady Bowen Hotel (previously Park Hotel). Williamson Street and Royal Hotel (right). Remains of Burke Street Wharf protection wall still visible top right. Showing a view of the Firth of Thames from Monument Hill. Showing the remains of the old Burke Street Wharf and the sea walls. Moanataiari flat on right later reclaimed. 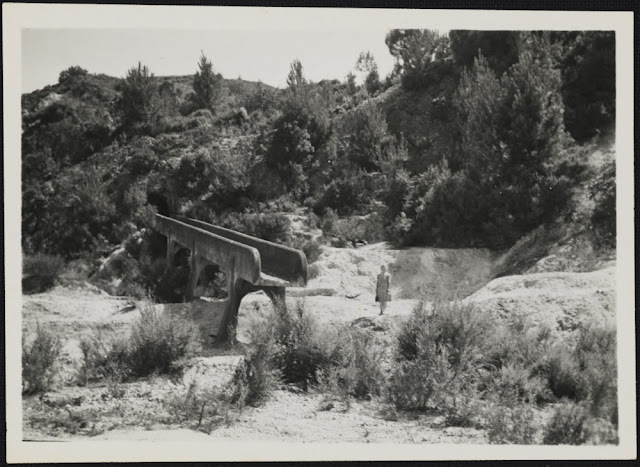 Now to one of the best, a photo of the old Moanataiari flume, that still stands at the Hauraki Prospectors Association grounds, at the northern end of Queen Street, before the Moanataiari Creek Road. 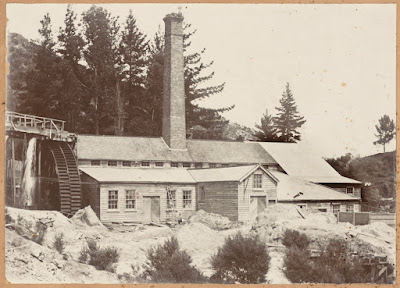 Showing a water race at Thames, the site of the former Golden Crown Battery, now the Thames Gold Mine Experience site [Hauraki Prospectors Association] adjoining the State Highway, across the road from Haven street. The area was formerly known as Tookeys Flat. The view today thanks to google maps (below). So remember, keep exploring, new photos are going online all the time! Share your favourite finds, and I will add them to the blog. 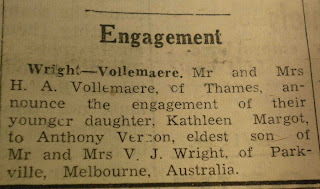 Researching your family in Thames? Then one of the best places to start to look for information is the newspaper. Over the years I have collected many notices, some of which have been indexed. 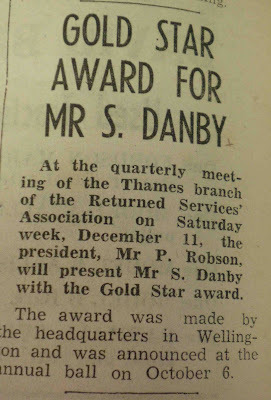 For instance this is an index example of Thames Star notices 1946 to 1955. LETTER SORT 'A' - If you would like me to do any searches, email me the details.